1- Andre Onana (Ajax Amsterdam): This Indomitable Lion is the latest from a long queue of shot stopping custodians to make their mark on the global game. Just like twice former African footballer of the year Thomas Nkono, Joseph Antoine Bell and Carlos Idriss Kameni, Onana is making waves as Ajax Amsterdam chase the Dutch Eredivisie and UEFA Champions League titles. For how long is Cameroon coach Clarence Seedorf going to choose Oestende keeper Fabrice Ondoa ahead of Onana? 2- Youcef Atal (Nice): More experienced rivals such as Tottenham Hotspur right back Serge Aurier are being put in the shade by this little known Algerian. Nice boss Patrick Vieira deserves plaudits for unearthing this gem. Atal is already a multiple goal scorer for Nice where his impact is being felt at both sides of the pitch as Nice ascend the French Ligue One table. 3- Khalidou Koulibaly (Napoli): Senegal star defender Koulibaly is one of the world’s premier central defenders. His impressive defensive credentials at Napoli has seen the club president reject a £100m offer from Manchester United for his services. In addition to speed, aerial prowess and strength in the tackle, Koulibaly is also adept at initiating counterattacks because he is very comfortable driving through crowded midfields with the ball at his feet. 4- Sol Bamba (Cardiff City): Paris born Ivorian defender Bamba is the living example of the adage, ‘age is just a number’. Even at the advancing age of 33, he is not only a mainstay for Cardiff City, he is the Bluebirds skipper. Bamba’s single minded defending was best exemplified by a crunching, match turning tackle that prevented James Maddison from netting a spilled penalty in the Bluebirds’1-0 victory over Leicester City. 5- Salif Sane (Schalke 04): Lions of Terranga powerhouse Sane is widely recognised as one of the Bundesliga’s top central defenders. This towering Senegalese World Cup defender has been instrumental in Schalke’s march into the Champions League knock out rounds. Sane has also chipped in with a couple of headed goals as Domenico Todesco’s side recovered from a nightmare start to the Bundesliga season. 6- Thomas Partey (Atletico Madrid): Black Stars all-rounder Partey has forced his way into a highly competitive Atletico Madrid side courtesy of his ability to play a number of positions. This nominee for the BBC African footballer of the year award can play a number two, holding midfielder or offensive midfielder. But I am deploying him in a defensive role to accommodate more creative attacking midfielders. 7- Nicolas Pepe (Lille Metropole): Dribbling wizard Pepe is perhaps the revelation of the season in French Ligue One where his direct running and ability to whizz past opponents has attracted the interest of Europe’s elite clubs including Arsenal. Pepe’s goal involvement (12 scored and 7 assists) makes him a much sought after talent. 8- Hakim Ziyech (Ajax Amsterdam): Morocco playmaker Ziyech is very much the directing intelligence for an Ajax Amsterdam side hot on the heels of PSV Eindhoven in the race for this season’s Eredivisie title. If you recall well, Ziyech is the same star whose play-making skills saw Herve Renard’s Atlas Lions better Portugal for possession and push Spain to the precipice of exiting the World Cup. 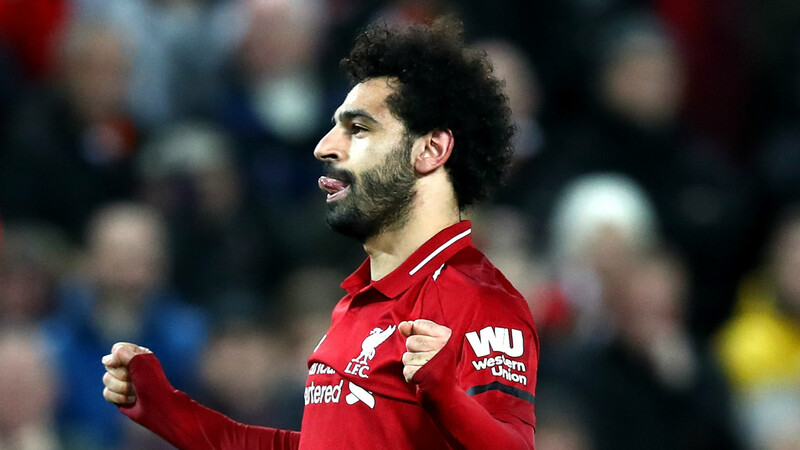 9- Mohammed Salah (Liverpool): Reigning Professional Footballers Association (PFA), Football Writers Association (FWA) and African footballer of the year Mo Salah is the continent’s top star at the minute. His 44 Premier League goals and a dozen more in other competitions has raised the bar for the continent’s footballers. Aspiring African footballers have an excellent role model to look up to. 10- Sadio Mane (Senegal): Liverpool forward Mane is the third Lions of Terranga player to feature in my line up. As part of a fabled front three, Mane is primed to help the Kop to their first Premier League title in almost three decades. With a bit of luck, he could even join Didier Drogba, Samuel Kuffour and Samuel Etoo as part of a small elite of African players to win the Champions League. 11- Ismaila Sarr (Rennes): After impressing for Aliou Cisse’s Senegal at the World Cup, young winger Sarr has taken his game to a new level. Blessed with pace to burn and a sharp shooter’s eye for goal, Sarr is French Ligue One’s most fouled player. He has also helped the side to qualify for the UEFA Europa League knock out rounds. Honourable mentions go to Mamelodi Sundowns’ Ugandan keeper Denis Onyango, Strasbourg’s South African forward Leno Mothiba, Manchester City’s Algerian forward Riyad Mahrez and Videoton’s Cape Verde left back Stopira Tevares.